Um…not work-work, just work on Planitia. I’ll be going back to work-work soon, though. Now, let’s get back to the feedback! All right, now let’s get to what you guys actually said! The most common feedback I got was “Holy crap it’srunning too fast my guys all flew off why’d they do that now the computer is here destroying my villages and now I’m dead.” So I will be slowing down the overall gameplay, for starters. Lots of people said that clicking the minimap to jump the camera around didn’t work consistently. This is due to the fact that it won’t work if you’ve got a spell on your cursor. I’ll get this fixed. One person (Dragon) said that he had trouble clicking the minimap to jump the camera around because he kept accidentally band-selecting. Band selection isn’t even supposed to be there any more since the introduction of the General. I’ll be taking it out. The most common strategy for human victory seemed to be either lightning-bolting the enemy general to death (which wasn’t supposed to happen, the general should be invulnerable) or quickly lightning-bolting the enemy village to death (which you can only do because I started players with full mana, which won’t be in the final game). Some players liked to fortify themselves and then use a combination of god powers and a large army to destroy the computer’s army, then push on the computer’s cities. This is closer to how Planitia is “supposed” to be played, but one problem is that the computer’s general just sits in the player’s base, pumping out units as often as it can. Because of this, I’m starting to think that the General should die when all units under his command are dead (just like villages die when all their villagers are dead). You won’t start the game with a general, he will appear near your main city as soon as you create a military unit. If all your military units die, he disappears, but he’ll reappear (again, back at your cities) when you create some more. This way neither you nor the computer will be able to camp inside the enemy’s base like that. Units are supposed to drown a few seconds after they fall into deep water. If you’re quick with the terrain tool you can save them. I’ll get this in soon. Simon Archer and many others asked for more animation on the sprites so players can tell what is going on better. I’d love, love, love to but I Are No Artist. 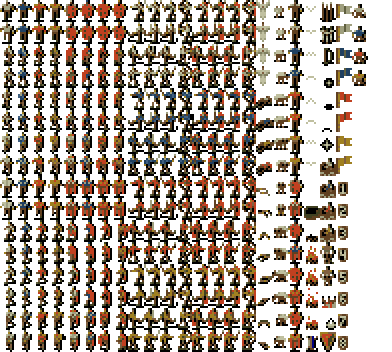 I’ve been looking for a sprite sheet that includes eight-way animations – something like this, only with run, walk and fight animations. So far, nothing. Other than Final Fantasy Tactics stuff, yes, I know. I don’t want to use those because they are too recognizable. And The sprites I ripped out of Powermonger are just too primitive-looking when applied to 3D quads. I had a couple people state that the multiple tabs were confusing, forcing them to either use god powers or the army or both. One person suggested consolidating the UI onto one tab, which…might happen. A couple people mentioned that it’s hard to tell when the terrain is actually flat. I was going to have flat cells draw with a different texture so you could tell…I probably will, but I don’t have an appropriate texture at the moment. So I’ve got a bit of work to do. I’m hoping to have a new version for you guys to try out Sunday. ~ by Anthony Salter on February 16, 2008.